The story in this game is a parody of the classic game, Super Mario Brothers (1984), the differences in stories isn't that much different from one another, the only difference is that the dragon is being the captive, while the princess is the kidnapper. While not very different, it is an effective enough switch to make the parody come in full effect to where you'll get that it is both making fun and making homage to the classic games that we all love. Does that mean that I liked the story? Well, I found it to be okay, it is very thin with nothing much to it but it did make me giggle. The gameplay is also a parody of classic platformers but it adds a very sinister twist that's about as cruel as a Sonic the Hedgehog (1991) rom hack that I once played (it was some cruel hack where the rings made Sonic fat if you collected too many)... Actually it isn't that cruel, still sinister though. The gameplay twist is that all of the good stuff you associate with platformers (rings, coins, power-ups, and all that other hoobie joobie) are now all evil, everything you associate with being evil in platformers (pits, ugly looking f**kers, spikes) are all good. All of this insanity means that grabbing stuff like coins will make you explode in an instant, while jumping on spikes will make you spring high and make tough platforms. The cruel twist is what makes the game hard because we have trained our brains into thinking that collecting coins, avoiding spikes, and all that hoo-hah is the right way to beat these kinds of games. Trying to beat this game will require you to think the opposite way and that can be tricky and that alone makes this game like it or hate it kind of game, there is no middle ground. I personally liked the gameplay, the mixture of tradition and experimental did make for a fun challenge, even though it will require you to think differently, it was done well enough to where it will not take very long to get the hang of things. I really liked the level design in this game and I found them to be well designed as each section was carefully thought out, there were no spots where this game felt like that it was rushed. Each level also has collectibles and objectives that you'll need to collect and complete in order to get deeper into the game and to also unlock bonus stages. The collectibles are bundles of dynamite and there are three to be found in each main level, they are placed in hard to get spots, so you'll need to think of a way to get them. 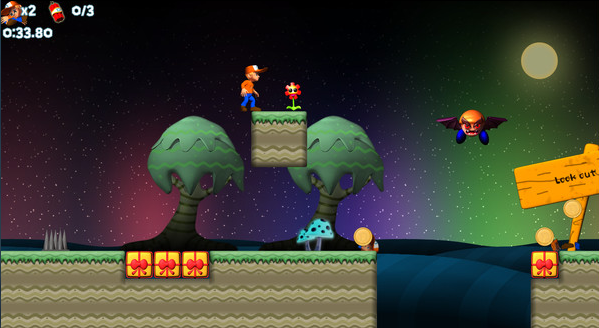 The objective that each main level has is that of trying to beat the stage in under a certain time and each stage has three times that you'll need to beat and doing so will earn you a star for each time you have beaten. Getting the stars will require you to know each stage inside and out and this can get really, really tricky. Getting killed in this game will add five seconds to the clock, so you'll have to avoid death as much as possible. 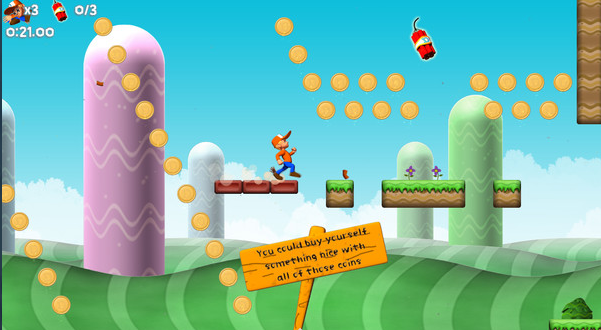 The bonus stages will have you trying to collect the very coins that kill you, the way that works is that the coins will make you explode and your scattered limbs will collect the rest of the coins. These bonus stages will earn you more stars, each stage has three stars to collect and in order to get all three stars per bonus stage, you'll have to try to kill yourself in as few tries as possible. 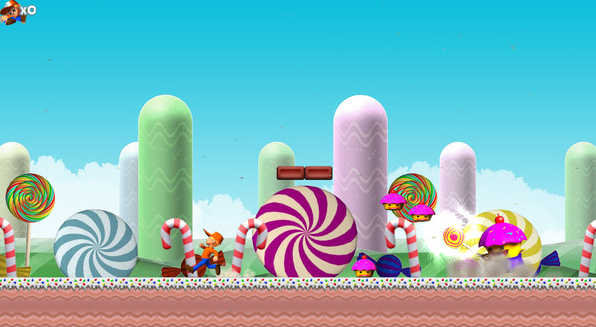 The bonus stages aren't very hard to do at all, you'll figure out the method very quickly. Beating the stages will not stop you from re-playing those stages as it is very fun to purposely kill yourself to collect the gold, so the replay value is decent for the bonus stages. The length of this game did bother me at first as I managed to get to the final boss in under an hour and I thought it was too short and anti-climatic. Wasn't too long until I saw that upon beating the game, you will then get another world full of much harder levels. Beating both worlds will stretch the gameplay time out to around three to four hours. The final boss itself feels a little out of place in this anti-platformer as it is a traditional boss battle you'd get in a serious platformer. I also found the boss to be simple to figure out but incredibly hard to beat, it did get to a point where I wanted to yank out my hair, staple my tongue to a tree, chant the words "Heinz means beans", and top it all off with me doing a re-enactment of the dance from the music video of TISM's song, "Greg! The stop sign!". With that said, the feeling of beating the final boss is a very satisfying and made me feel very proud of myself. Controls in this game are incredibly simple and effective, all you do is use the arrow keys to move around, use the X key to jump, and holding down the M key will enable Dan to run. 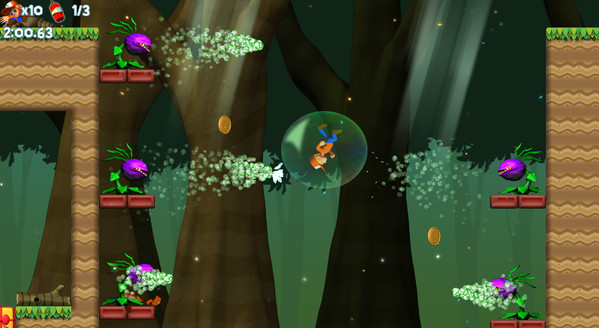 Controls are very tight and responsive and it does help to make the gameplay to be very enjoyable. For those that like to play with a controller, an NES USB controller would work very well with this game as this game has an NES style of controls due to just using the arrows and two buttons. 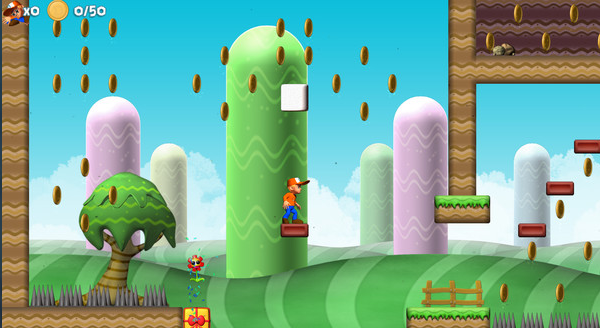 The graphics in this game uses a weird and outdated three-dimensional look, it looks like it is paying homage to New Super Mario Brothers (2006) for the Nintendo DS or a game you find on mobile phones. I'm a bit mixed on the look, I do like the backgrounds as they remind me of claymation but I am in the middle when it comes to the design for Dan, the good baddies, and the main boss as they look very wooden. The animation also looks a bit weird and floaty and mix that in with the wooden look of the characters, you've got an unintentional (or maybe not) game that looks like a puppet show. Music in this game is very generic sounding but it isn't terrible, just not very memorable. Overall, this game is not the prettiest jewel on Dame Edna's glasses, but it does have some well designed levels and tight gameplay. The biggest problem you will face with playing this game is the gimmick, it is very hit or miss but I did like it. Good for gamers that like old school platformers and games that like to take the piss out of other games. Sounds kind of fun, in a fucked up sort of way.